You don’t see a lot of cats going out for jogs with their owners, well, I certainly don’t. This is due to a lot of reasons that we won’t get in to today, but it is important to note that cats still benefit greatly from physical activity. It is basically ingrained in them to stalk, hunt & pounce. My cats are a trip and if they don’t get a play session they just run up and down the hallway at full speed from one end of the house to the other, I suppose this is their version of jogging! That being said, if cats don’t get some exercise not only do they tend to get cranky and do things like meow all night long, they can also get in really unhealthy shape. This is typically shown by them gaining a significant amount of weight which can lead to all sorts of problems. Given this it is important for you as a cat owner to ensure your cat is getting not only a healthy high protein diet, but that your cat is also getting lots of exercise! 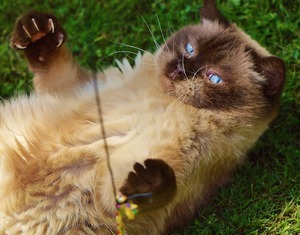 So let’s look at the options available to for exercise and how to play with your cat! Curiosity Driven: Since cats are so darn curious use it to your advantage to keep your cat active. Every time you order a box or a package from Amazon or hit up the grocery store be sure to leave the bags and boxes out for your cat to explore. 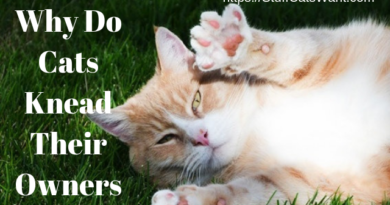 Get Them Scratching: Cats absolutely love to scratch for a variety of reasons, but it is a great activity that helps them tone their muscles and get a full body stretch. Be sure to keep a scratching post around for your cat not only for exercise, but to ensure they aren’t scratching up your furniture. 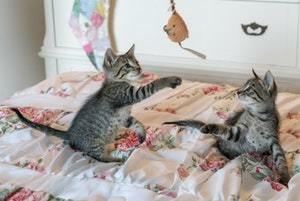 Tag Team Play: While not all cats will play well with others this can be a great option for cats that are social and playful. If you only have one cat at home consider another cat. While it may seem like more work there is actually very little impact to you as well introduced cats will often become best buddies. High Flying Cats: Given that cats absolutely love to climb things and you’ve likely trained your cat to stay off your counters then be sure to provide something your cats can climb on. I recommend a cat tree or a cat castle as not only does it make a good play place, it often doubles as a scratching post and triples as a bed. Human Interactions: Encourage your cat to chase toys like balls of yarn, string, little mice, etc. You can also consider a wand toy which my cats will bat around for ages. Laser pointers are another option but do be careful not to shine the pointer in your cat’s eyes. Automatic Toys: There are a multitude of automatic toys out there that will help your cat find something to do if you’re too swamped to play with them. These will get you off the hook sometimes, but I highly recommend actual interaction with your cat. 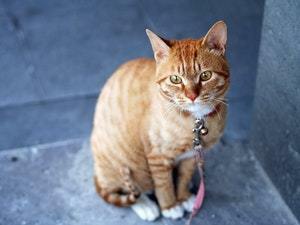 Leash & Harness Training: Train your cat to become an adventure cat on a leash and a harness! Most cats will take to this training, especially if you start them young. This will let you get your cat out into the great wide open on a hike or just a walk. 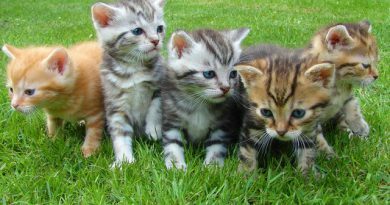 Cats love going outside for the new scents and smells so long as they are in a safe environment. Be sure to get your cat flea prevention medicine if you do decide to take her outside. Clicker Training: While not all cats are easy to train, those that are quite active already tend to respond the best. You can train your cat to perform all sorts of tricks with a clicker. 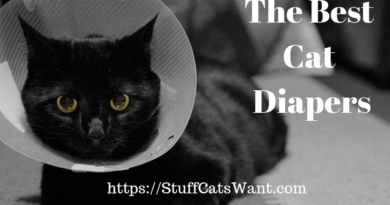 Check out this article for more details on clicker training your cat. Food Puzzles: These puzzles are specially designed cat toys that require your cat to work to remove treats inside by batting the puzzle all over the place. Keep in mind this does often dump food all over your floor so it can make a mess. Install a Bird Feeder: If you have a window where you can install a bird feeder this is a great way to keep your cat engaged. Now there are obvious concerns depending on the cat so you need to be careful. My cat Lexi loves to just do her but wiggle and prepare to pounce while she watches the birds. This keeps here engaged for long periods of time during the day even if she isn’t running all over. Cat Bubbles: A newer item on the market are catnip bubbles. They are totally safe for your cat, but I’ll freely admit I’ve had difficulty blowing a large number of bubbles at once. 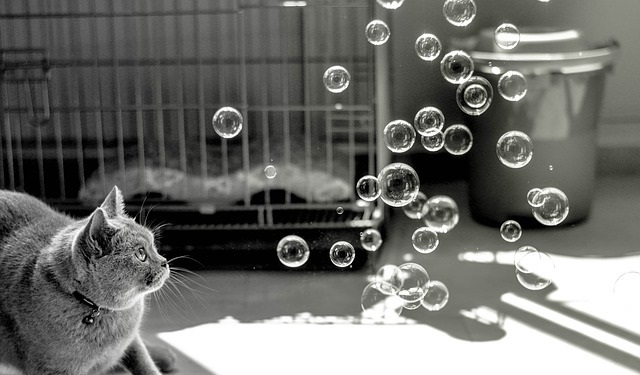 My cats have actually run off afraid of the bubbles, exercise of a sort I suppose! Cat Exercise Wheel: If your cat is really active and needs a way to burn energy quickly you can train her to use an exercise wheel. Just like a treadmill for humans these wheels are intended for cats that have a ton of energy. It will require distinct training, cats don’t usually just figure it out on their own. At minimum an adult cat should have a least one structured play session per day. That being said if you have additional time available and you can play with your cat before you leave for work or school they will definitely appreciate it. The younger a cat is and the more energy they have will dictate if you need additional sessions to tire them out and keep them on a workable sleeping schedule. I’d highly recommend your last play session of the day be right before you feed your cat dinner because this will play off of their instincts and they’ll be more likely to follow the standard hunt, eat, groom & sleep pattern. Are There Any Toys You Recommend? There are so many toys on the market that it is hard to keep up with them all! The key for cat toys is having both a variety and ensuring that you as their owner are involved in their play. If you’re looking for specifics then check out the article at the button below for my favorite cat toys. 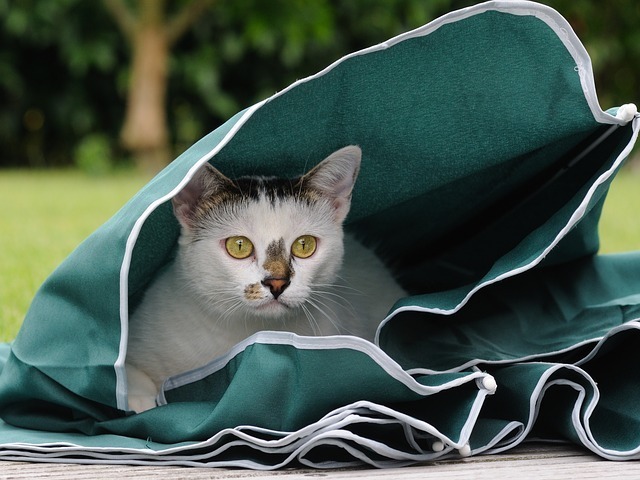 While cats in general are pretty active animals and they’ll often self regulate how rough or how wild they want to get with playtime, you should definitely talk to your vet on your next visit to ensure the type of play routine you’ve established is a good fit for your furry friend. If your cat has any health issues, ask your veterinarian to recommend activities that fit your cat’s individual needs. And always be sure to choose toys wisely. You don’t want to pick toys that might break into small pieces that your cat can swallow as not only could it be dangerous for your cat, it could also run you a hefty vet bill. The ones I find worth keeping the closest eye on are string and wand toys. Cats are very prone to chow down on these kinds of toys if left unattended. If you have any other thoughts on the why playing with your cat is important and methods to ensure they get great exercise then please leave a comment below or send me an email at Craig@StuffCatsWant.com so I can update this article. 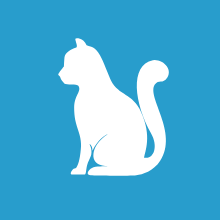 ← Why Does My Cat Sleep So Much? I’m Jealous. Thanks for this information. I never realised cats needed a play session, or that not having one meant they get cranky. I have only ever known my family cats to have been on and off cranky, this explains why. The suggestions for play are inspiring, I didn’t realise there are so many, do you find the bird feeder encourages the cat to chase birds when outside? My mum gets upset when her cat catches birds. Good question. My personal opinion is that house cats don’t really belong outside. While there’s a raging debate on this in the cat world, cats have been shown to decimate local animal populations when they are let outside. They are also much more likely to get hurt or get sick when they are outside. Given this I keep mine inside and ensure they get play sessions that mimic the hunting they do outside. While maybe not playing, petting your cat is super important as well. It helps develop a positive bond with your cat that keeps her happy. I would normally aim for a play session of 15-20 minutes if you can keep your cat engaged that long. Some get bored pretty quickly. This article is very helpful thanks. My boy is getting a bit more on the older side as he’s almost 8 and laying around is pretty much all he ever does. I am trying to get him to move around a bit more. He doesn’t go outside much either. Although he gets along with the dogs just fine I think they might be a little too playful for him. Your list has a few great suggestion to get my boy moving a bit indoors. Thanks for stopping in! 🙂 Glad the list is helpful and do let me know if you run into any questions! I can never quite figure cats out lol. We had our cat since she was a kitten and she used to be very playful. But then she grew up and became less playful. I guess that’s what happens when animals get older just like people. Thanks for your insights into the number of different ways cats can play. Although we didn’t really have many toys for our cat to play with, she did have human interaction to make up for it. Human interaction is by far the most important from what I can tell. If you spend time with them, pet them, brush them etc. it makes all of the difference! Glad to hear your cat is happy and healthy :). your site is really informative & interesting. Most of the time I feel like when people think about playing with their cats, they just think about picking up a couple of toys at the pet store and leave it at that. But this article shows you there’s so much more! Something interesting I saw on a cat show, was something called “cat TV” to keep them occupied. Getting things like aquariums (even fake ones), access to windows to watch outside, etc. I thought that was pretty cool! You’re absolutely right, there are TV channels for cats and even a bunch of mobile applications for your tablet that are specifically designed for cats. It is a riot how many different ways there are to play with your cat!